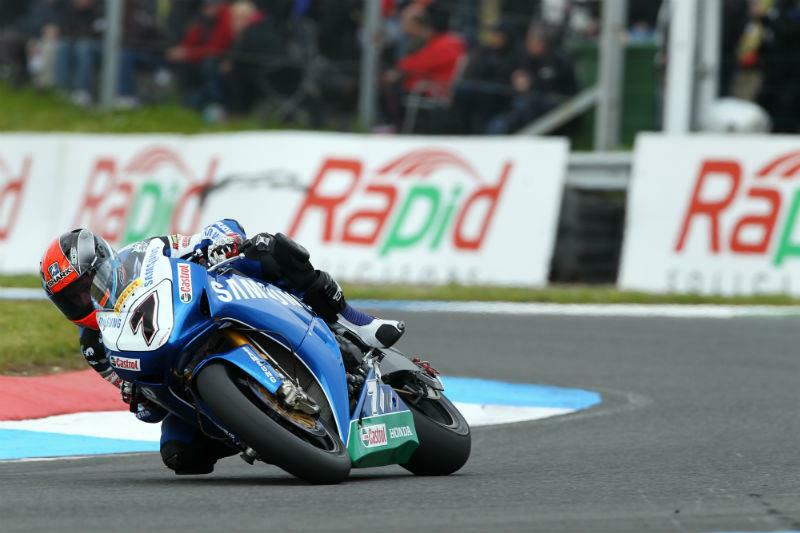 Samsung Honda's Michael Laverty won the second British Superbike race at Knockhill this afternon, his second race win of the season. Swan Yamaha rider Tommy Hill took the lead from the line and managed to hold off Laverty, after the Irishman tried to take the lead several times at the final hairpin. Laverty eventually took the lead at the end of lap 12. Race one winner Shane Byrne then passed Hill at the final hairpin a lap later, relegating the reigning champion to third place. Byrne was unable to catch Laverty as he stretched out his lead. Tyco Suzuki rider Josh Brookes missed out on the podium in fourth place, despite looking threatening towards the end of the race. Swan Yamaha's Noriyuki Haga crashed on lap 18 while battling for fourth spot with Brookes. Padgetts Honda rider Ian Lowry had another disappointing race after his crash in race one. After a good start Lowry looked to have grip problems and dropped down the field, eventually finishing 10th. James Westmoreland (Team WFR Honda) had an excellent ride to finish fifth ahead of Supersonic BMW's Tommy Bridewell.